The Oconee County Board of Commissioners will take up three controversial items on Tuesday night, each of which could bring out a crowd. The first, in order of appearance on the agenda, is a call for a referendum on the sale of distilled spirits by the drink in restaurants in the county. The second is a zoning request by Sarah Deck, 1210 McRees Mill Road, southeast of Watkinsville, to allow for a 199-foot-tall cell tower on her farm. The third is a set of three agreements the county is being asked to sign with the Georgia Department of Transportation for widening and reconstruction of Jimmy Daniell Road, for widening of Daniells Bridge Road, and for a new road connecting Daniells Bridge Road to the Oconee Connector via a flyover of Loop 10. The Board also will consider a call for the 2015 Special Purpose Local Option Sales Tax referendum, approval of loan documents for Hard Labor Creek Regional Reservoir in Walton County, and a $360,508 increase in payments to Moreland Altobelli Associates Inc. of Norcross for work on the second phase of the Mars Hill Road project. Liquor-by-the-drink, the cell tower, and the roadway projects are most likely to generate citizen reactions at the meeting, scheduled to start at 7 p.m. at the courthouse in Watkinsville. At the meeting last Tuesday, only nine people opted to voice an opinion on whether the BOC should put a referendum on the ballot in November so voters could decide if they want to allow for the sale of liquor in county restaurants. Six of the speakers were in favor of the referendum, and three were opposed. Proponents said that citizens deserve another chance to vote on the issue, while opponents spoke against liquor-by-the-drink itself. The last time the referendum was on the ballot was in November of 2002, when 54.5 percent of the voters turned down the change in county liquor laws. Only Commissioners John Daniell and Margaret Hale have expressed reservations about holding another referendum, meaning that any motion calling for a referendum is likely to pass, perhaps with Chairman Melvin Davis breaking a tie, as he did when the BOC approved beer and wine sales in restaurants in 2008. The Oconee County Planning Commission voted 5-3 on July 21 against recommending to the Board of Commissioners approval of the proposed cell tower on McRees Mill Road. Eight people spoke against the proposal, while only Jennifer A. Blackburn, an attorney for Verizon Wireless, spoke in favor. The opponents said the tower would disturb the rural character of the area and detract from the value of their properties. Verizon is proposing to lease 10,000 square feet of the Deck property, which is zoned for agriculture, for the monopole tower. The special use permit is required before Deck can lease the land for the tower. The tower will have the capacity to serve four carriers, according to the application materials. Blackburn filed the usual objection that denial of the permit would be unconstitutional on July 29, following the Planning Commission action. BOC Chairman Melvin Davis provided the four voting Commissioners with project framework agreements for the Jimmy Daniell and Daniells Bridge Road projects before last Tuesday’s (July 29) agenda-setting meeting. Included was a memo he had drafted for the commissioners on July 10 and letters he had received from GDOT on July 3 for the two Daniells Bridge Road projects and on July 9 for the Jimmy Daniell Road project. Two of the three GDOT letters, all from Kim R. Coley, district planning and programming engineer in Gainesville, misidentified the roads involved and had to be corrected by the county. In each case, the letter was attached to a 22-page legal agreement with six attachments. One of those attachments in each case spells out the funding sources for the project. Another spells out a project time line. All three projects have been in the planning stages for years and are in both the current Madison Athens-Clarke Oconee Regional Transportation Study (MACORTS) list of projects, adopted in October of 2013, and in the MACORTS draft of projects, dated June 25, 2014. But the time lines and even funding figures before the BOC on Tuesday night are different from what are in the MACORTS documents, which are the official public documents on the three projects. The most important change is in the time line. The documents before the BOC on Tuesday night show construction funding for all three projects being authorized in 2018. No public announcement had been made that the time lines for the project were under review. 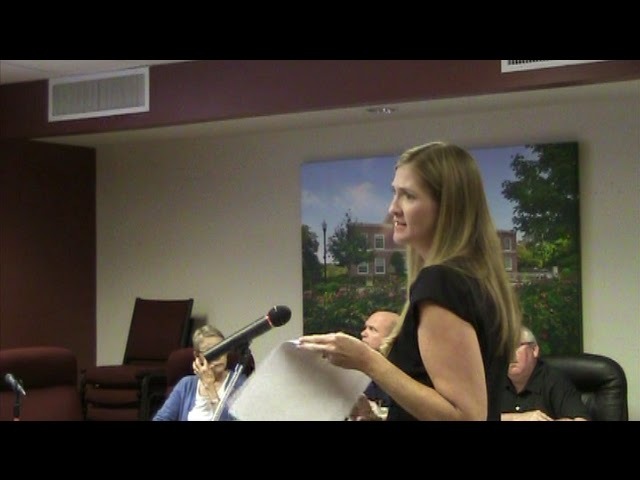 I noticed the reference to the two Daniells Bridge Road projects when County Clerk Jane Greathouse released the agenda for the July 29 meeting on the afternoon of July 24 and informed the leaders of the Home Owners Association in Welbrook Farms, where I live and which is on Daniells Bridge Road. Three of the four who spoke in opposition to the projects on July 29 live in Welbrook Farms. I was one of those. Rich Waller, chair of the Oconee County Industrial Development Authority and a resident of Birchmore Hill, across Daniells Bridge Road from Welbrook Farms, also spoke in opposition. The June 25, 2014, MACORTS document lists the Jimmy Daniell Road project as a widening and reconstruction of the road to four lanes with additional turn lanes from SR 316 to the Atlanta Highway. From the map in the MACORTS document, it appears that about one-third of the project is in Clarke County, but much of that follows the New Jimmy Daniell Road and already is improved. Construction is programmed as Long Range in the document, but the year 2020 also is listed. Total cost is listed as $26.3 million. The project framework agreement before the Oconee County Board of Commissioners lists the total project cost as $21.7 million, with the local government picking up 5 percent, or $1.2 million. It does not specify how much of that Oconee County is to cover and what part will be covered by Athens-Clarke County. The federal government is to pick up 76 percent of the costs. The design work is to be approved by June of 2015. The MACORTS document of June 25 of this year states that the Daniells Bridge Road widening will add two additional lanes to the roadway from just south of Chestnut Hill Road to Hog Mountain Road. The cost is listed as $9.1 million. The letter attached to the project framework agreement before the BOC on Tuesday night states that the project involves the construction of turn lanes on Daniells Bridge Road from Mars Hill Road to Hog Mountain Road. The project cost is $3.9 million, with Oconee County picking up 76 percent of the costs, or $2.8 million. The most likely source of funding would be SPLOST 2015 revenue. The county already has built a center turn lane on Daniells Bridge Road from Mars Hill Road to Founders Grove Boulevard and has said that it cannot add more than a single lane to the roadway through the elevated blind curve east of that point without purchasing additional right of way. The existing bridge over Barber Creek–the descendant of Daniells Bridge–can only handle two lanes of traffic. Planning for that revised project is to be completed by May of 2015. 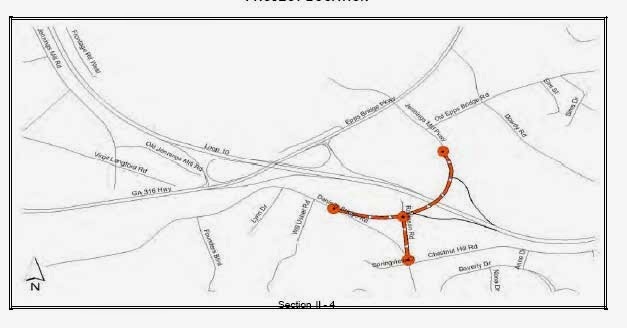 The MACORTS June 25 document includes construction of what is called Daniells Bridge Road Extension, which would run from that part of the Oconee Connector (also called Jennings Mill Parkway) east of Home Depot, across SR Loop 10, to the existing Daniells Bridge Road. The project also would include a roadway, running along the route of the unused Robinson Road, connecting the new extension with the existing Daniells Bridge Road at Chestnut Hill Road. That roadway along Robinson Road would replace the existing Daniells Bridge Road for through traffic. The new extension would consist of four lanes, a raised median, sidewalks on both sides, and signals at the intersection of Daniells Bridge Road Extension and the new Daniells Bridge Road (old Robinson Road) and at Chestnut Hill Road. The total cost, including the flyover of SR Loop 10, is listed as $4.8 million in the MACORTS document. The cost of the Daniells Bridge Road extension in the GDOT agreement before the BOC is $4.9 million, with the county to assume 6 percent and the federal government 75 percent. The county’s cost would be $300,000. SPLOST funds would be the most likely source. Planning is to be completed by May of 2015. The MACORTS document states that exits and entrances to SR Loop 10 from the flyover “should be considered” during that project engineering phase. The GDOT agreement takes no stand on that issue. The goal of the construction of the Daniells Bridge Road extension with flyover would be to create a loop connecting the emerging commercial center of the county. Traffic would flow from the intersection of Mars Hill Road, Daniells Bridge Road and the Oconee Connector past Epps Bridge Centre and any new developments in the area. It then would flow past Home Depot and the related development and back to the Mars Hill Road, Daniells Bridge Road, Oconee Connector intersection along Daniells Bridge Road. Such a loop, without additional changes, would be mostly four lanes wide, sometimes with elevated medians and sometimes with center turn lanes, until it reached the existing section of Daniells Bridge Road at the blind curve. From that point to the Mars Hill Road, Daniells Bridge Road, Oconee Connector intersection, it would be three lanes wide. And the blind, elevated curve, which is the product of the construction of SR 316 and SR Loop 10, would remain. County Administrative Officer Jeff Benko gave no indication of the altered time line or the reason for it when he introduced the three agreements to the commissioners and the public on July 29. A number of commercial properties are listed for sale along the roadway, including two prominent ones by Nichols Land and Investment and a large number by Boswell Group. Boswell Group is owned by Jamie Boswell, who is the area representative to the Georgia Transportation Board, which oversees GDOT projects. One Boswell listing is for 62 acres that formerly were Evergreen Nursery. The sign for that property is at the blocked end of the Connector at Home Depot. The Evergreen Nursery property fronts on the Oconee Connector, Dowdy Road, and SR Loop 10. According to the Boswell web site, the property is under contract. Bill Ross, president of Evergreen Nursery Inc, which now is located at 1501 Dials Mill Road, sent a letter to Presbyterian Homes of Georgia last summer proposing the Dowdy Road property for a retirement center after PHG pulled out of its proposed project on Rocky Branch Road. It is not possible to know, based on public records, what expectations any purchaser of the property might have about the time line for construction of a flyover and connection of the roadway to Daniells Bridge Road. Roads usually are justified as means of eliminating traffic congestion, but at least some research indicates they do just the opposite. A 2011 study published in The American Economic Review by researchers at the University of Toronto and the London School of Economics concluded that building new roads and widening existing ones results in new traffic as motorists decide to use the improved roadways. Traffic on the new and widening roads continues to expand until it reaches the original level of congestion. The research was based on traffic data from the continental U.S. When Oconee County moved construction of the Oconee Connector ahead of the widening of Mars Hill Road, officials made reference to congestion on SR 316. The real goal, most now acknowledge, was to open up the area that is now Epps Bridge Centre for development. Federal, state and local monies were used for that project. Many of the roads referenced in this report have multiple names and multiple spellings of names. I have used Daniells throughout, reflecting the historic name of the family after whom the roadway was named. The county has preserved, albeit with minimal land around it, the Daniells home on Founders Grove Boulevard just off the existing Daniells Bridge Road. The original bridge was over Barber Creek, though probably not where the current bridge is located. "County Administrative Officer Jeff Benko gave no indication of the altered time line or the reason for it when he introduced the three agreements to the commissioners and the public on July 29." Jamie Boswell sure is getting a lot of mileage from being the the GDOt Board. What a coincidence his day job is benefitting from his "service" on the GDOT Board. Wonder what an open records request would look like for all e-mails between Boswell, Melvin and Benko? Oconeeians: A handful of people run and control our county. The other four commissioners are bystanders who go along to get along, no questions asked. We had one commissioner who was not a bystander, Margaret Hale, but we lost her to the election by a slim number of votes unfortunately. There are three commissioners: Melvin Davis, his ego, and the other group of four. Hale had to be there to make a showing occasionally. The rest are running scared of various appointed and otherwise overseers.